The Sten (or Sten gun) was a family of British 9 mm submachine guns used extensively by British and Commonwealth forces throughout World War II and the Korean War. They were notable for a simple design, low production cost, inaccuracy - and tendency to jam as in the assassination Reinhard Heydrich. 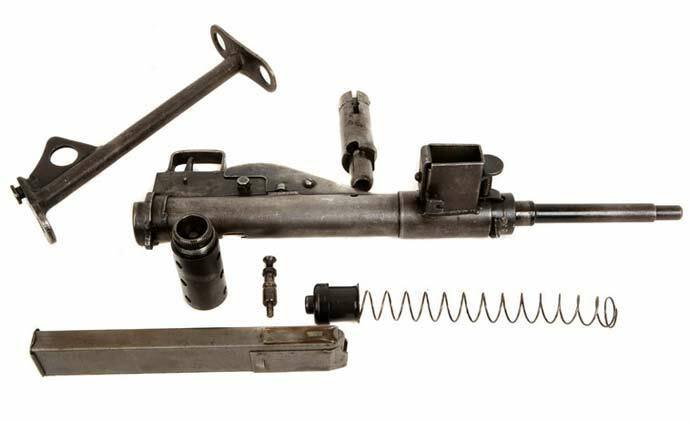 The Sten required a minimum amount of machining and manufacturing effort by using simple pressed metal components and minor welding. Much of the production could be performed by small workshops and the firearms assembled at the Enfield site. Over the period of manufacture the Sten design was further simplified: the most basic model, the Mark III, could be produced from five man-hours work. Some of the cheapest versions were made from only 47 different parts. It was distinctive for its bare appearance (just a pipe with a metal loop for a stock), and its horizontal magazine. The Mark I was a more finely finished weapon with a wooden foregrip and handle; some later versions were not quite as spartan. Anecdotal evidence suggests British soldiers did not like the unreliable and inaccurate Sten gun, swapping it for a captured German MP40 whenever possible; it seems that the German weapon was superior. The Sten gun was chambered for the 9x19mm Parabellum pistol cartridge. The Sten was small and could be stripped down into a set of easily concealed components and was therefore particularly suited to partisan operations on the continent or in Special Operations Executive operations in German occupied France. Guerrilla fighters in Europe became adept at repairing, modifying and eventually scratch-building clones of the Sten (over 2,000 Stens and about 500 of similar Błyskawica SMGs were manufactured in occupied Poland). Austen MK I The Mark I Austen (from "Australian Sten") was a 9 millimeter Australian submachine gun derived from the British Sten gun developed during the Second World War by the Lithgow Small Arms Factory. Approximately 45,000 Austens were produced from 1942 to 1944. They remained in service as a standard weapon of the Australian Army until 1966.